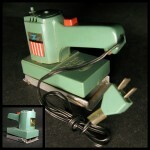 In 1969, order the Ideal Toy company came out with a line of fully operational miniature powertools that plugged into battery supplies built into their small carrying cases. This “Powermite” sander is about three inches long by two inches tall and less than an inch wide, order and came with little sheets of sandpaper, for sale which clamped onto its pad much the way full-sized ones do today. You get the sense from holding this that you could – quite literally – build an entire dollhouse with a full set of them. A full set looks something like this. I found this for a few bucks in an antique store.